I wanted to Join Ginny’s Yarn along again to tell you: Yes, I finished Michael’s sweater vest. Well, and than came friday and everything started to be a bit frustrating. I was about to finish the vest on the weekend and Michael tried it on… and then it was back to square one as it didn’t fit at all. But I’m already a good way up again. 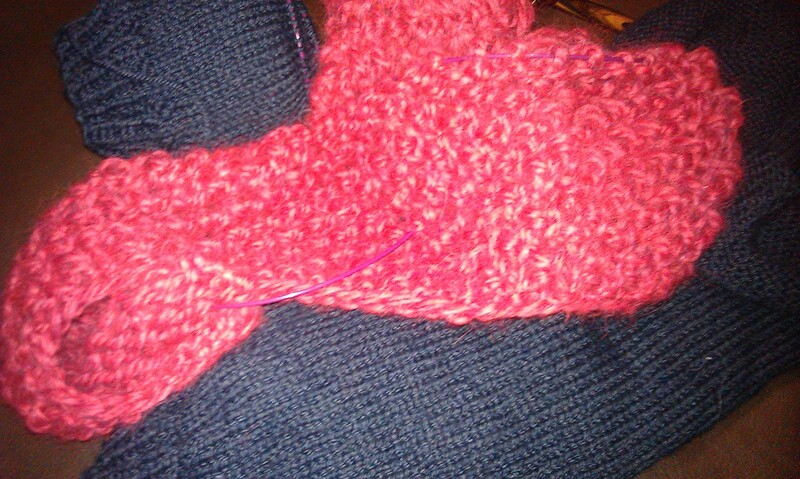 And I started a cowl from beautiful soft dark red Baby Merino wool that I bought on my trip to Amsterdam. Unfortunately I wasn’t to sure how to do it and then I messed up the pattern and I started new as often as four times. Frustrating too! But now I think I’m on a good way. Let me quickly remind you: today is your last chance to grap the give away from my guestblog tutorial by leaving a comment! This entry was posted in Knitting & Crocheting and tagged Cowl, Knitting, Sweater vest, Yarn Along by kathatravelling. Bookmark the permalink.